The Rice Pilaf I made a while back is a perfect side for most meals since it doesn't involve very complex flavors yet is still extremely tasty. It goes with almost everything, so it's definitely a good recipe to have on hand. I made a batch for Chris and I recently, and I usually cut recipes in half if I know we won't eat the whole thing, but for some reason I decided to make the whole darn thing this time. It made about four cups of cooked rice. For two people. My bad? Instead of eating the leftover rice as it was, I decided to replicate one of my other favorite rice dishes: arancini! The original recipe includes tons of cheese, but making it with rice pilaf was beyond good. 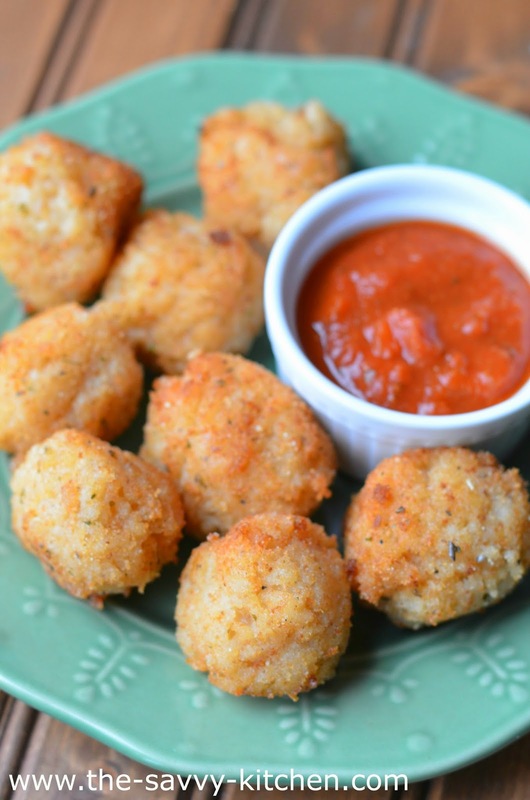 The onion, chicken broth and seasoned salt give the rice tons of flavor, and frying them gives them a crunchy crust. They're such delicious and fun little bite-sized treats. 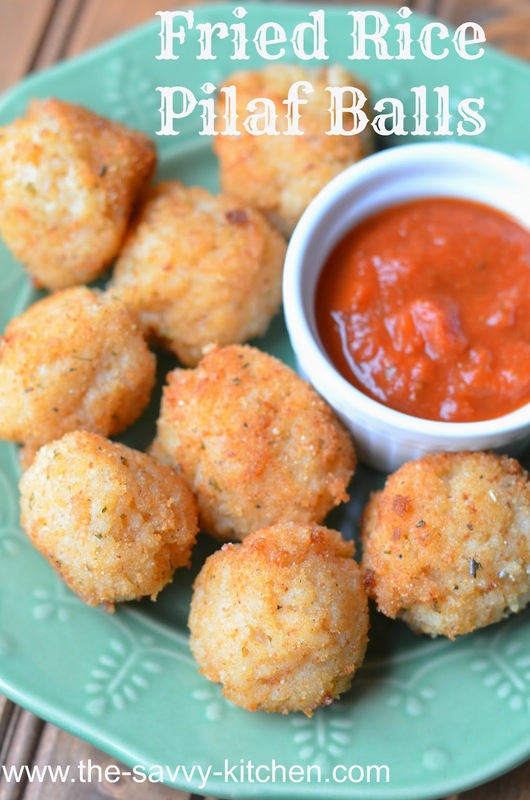 Dip them in some marinara sauce and you have yourself a cute little appetizer or side dish! 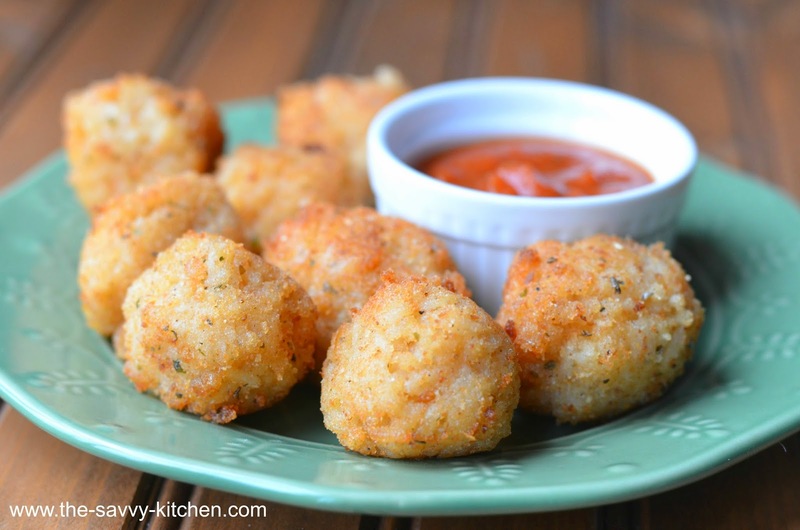 These would be an absolutely perfect side dish for this Easter Sunday. Enjoy! Shape the leftover rice into small, walnut-sized balls. Make sure they are compact so they don't fall apart while cooking. Place the breadcrumbs in a small bowl. Roll the rice balls in the breadcrumbs and shake off excess. Heat the canola oil so it coats the bottom of a small skillet with about 1/4 inch of oil. Add half of the rice balls in an even layer. Cook for about 2-3 minutes per side, or until light brown. Remove from oil and place on a paper towel-lined dish. Repeat with the remaining rice balls.